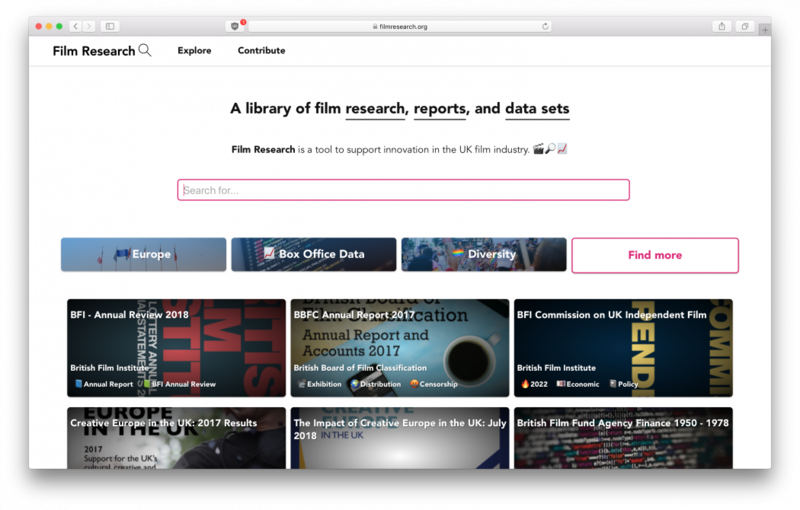 Film Research, like the name implies, is a library of film research, reports and data sets. Andy Rae from Film Hub Midlands, who created the site, explains his motivation and selects three of the best resources that he recommends for film exhibitors. The film industry creates dozens of research studies every year, and for the past few years I’ve been collecting all of them. I put them all in a folder on my computer, until that grew so massive I started grouping them into subfolders. And sharing them with colleagues when they might be useful. Then I started tagging them with the main themes. This got a bit clunky, so I put all the titles in a spreadsheet, and shared this too. And in January I launched FilmResearch.org. I’ve picked three of the best resources for film exhibition that are worth interrupting your day for. Regional Screen Scotland present a study examining 12 cinemas in Scotland, exploring their contributions to the local audiences. This is really about the social value of cinema and what it means to communities, but also how cinemas are measuring the impact of their work. Agnès and Mikel visited 90 cinemas in 120 days across 17 countries in Europe, ending with a report that discovers how cinemas have adapted across the continent, and highlighting some of the innovative work they do. This report is a great place to start for new and emerging ideas, I like to use it to inspire people to try something new. A classic from 10 years ago, Tentpoles and Pixels is how to run a cinema 101. Whilst some elements will be outdated, the core functions of developing a viable business remain, and I still point new and emerging cinemas towards this resource even now. These are just three great ones – there’s hundreds more to discover, and the best way to get started is to Explore, or search for what you’re interested in. I’m never finished adding new resources – so let me know if you’ve found something I haven’t.